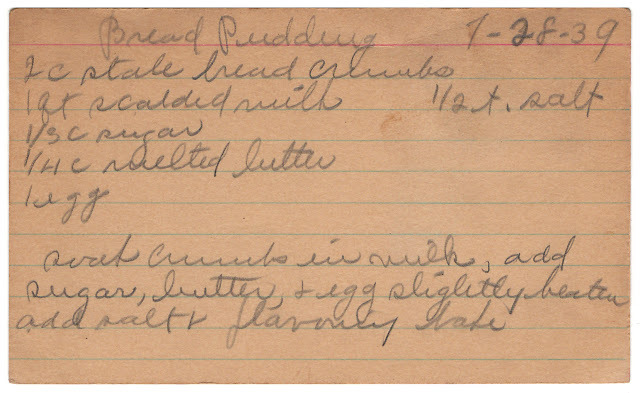 This recipe for Bread Pudding was handwritten in ink on an index card that had been darkened with time. It was found in a small red metal recipe file box worn with age. The original recipe card is dated “7-28-39”. I believe the “stale bread crumbs” called for in the recipe refers to “cubes” rather than “crumbs”. There are no details in the recipe as to how long to bake and at what temperature. Soak crumbs in milk. Add sugar, butter and egg. Add salt and flavoring. Bake. I believe the "bread crumbs" refers to "cubes" instead of "crumbs". Original recipe dated 7-28-39. There are no details in the original recipe as to how long to bake or at what temperature. After a week of increasingly colder temperatures, our meteorologist warned of snow followed by our first major freeze...12°F. I should have expected it. After all, my tomatoes froze on the vine right about this same time last year and then fall decided to warm up for another month. Every year I hope the garden will last just a little bit longer. Unfortunately, it looked like the short growing season was at its end this year and it was time to close the garden. Lucky for us, cold spells seem to always be preceded by a really nice day and this particular Saturday was no exception. The warm sunshine and 60°+ weather made the chores ahead go much more smoothly. Mr. LH and I drained our sprinklers (they weren't scheduled to be blown out for the winter for another few weeks), disconnected all the water hoses and raked the leaves off the lawn. Then I pulled all my bean and cucumber plants and gave them to Turtly to enjoy. I may not enjoy closing the garden, but he sure does! I just kept adding to the pile all afternoon. He attacked that pile of bean plants over and over again throughout the day, doing his best to finish it all...and he almost did. I was left with only a small pile of stems. After losing so many tomatoes in last year's freeze, I was determined to save as much off my plants this year. I picked every last green tomato. I didn't know what I was going to do with them yet, and a lot of them were really small, but I still picked them. The following day while snow fell, I washed, peeled and chopped those tomatoes (a vegetable peeler works great for peeling green tomatoes). I wound up with 22 cups of chopped green tomatoes!!! I've never eaten green tomatoes before (surprising, since I grew up in the South) so I decided to experiment with some canning recipes. My Ball Complete Book of Home Preserving book had three recipes I wanted to try: Salsa Verde, Green Chili Sauce (not to be confused with Hatch Green Chile Sauce) and Green Tomato Hot Dog Relish. With 22 cups of tomatoes, I had enough to make all three recipes if I halved the green chili sauce recipe (I would still wind up with a lot). I made the Green Chili Sauce immediately. The recipe called for quite a bit of brown sugar but I only used half. Having never tried regular chili sauce before, I wasn't sure what to expect. We tried some of it on our hot dogs and it was quite tasty! I much prefer it to pickle relish. After making only half the recipe, I still wound up with 6 1/2 half-pint jars. The following day, I made the Salsa Verde. Again, this was a new one for me. I used about 6 jalapenos from the garden and one very large red onion. I had just a (large) spoonful more than 6 half-pint jars so I seized the opportunity to try some on tortilla chips. I had never had salsa verde. I always stuck with my tried and true salsa. I was pleasantly surprised by this recipe as well. We haven't yet tried some after the canning process. Perhaps it will get even better after sitting for a bit. The tomatoes for the hot dog relish are still waiting for me in the freezer. When we're snowed in this winter I'll pull them out to to make the relish recipe. Pumpkin Pie is definitely a fall favorite. In fact, my family loves it so much that we decided it was no longer “just for Thanksgiving” Pumpkin Pie is so quick and easy to throw together that we have it much more often than just once a year! And it really came in handy when Mr. LH had his wisdom teeth removed...pumpkin pie to the rescue! 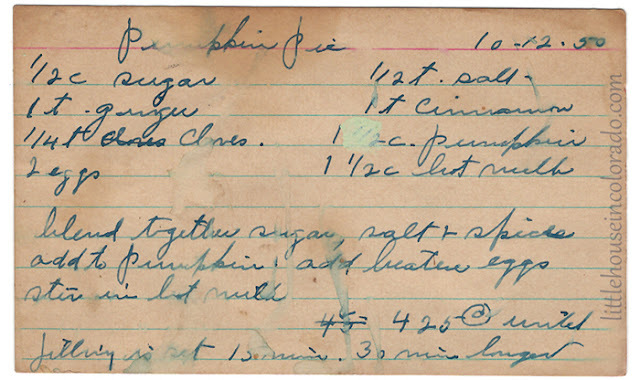 This vintage Pumpkin Pie recipe was handwritten in ink on an index card that had been darkened with time. It was found in a small red metal recipe file box worn with age. The original recipe card is dated “10-12-50″so that’s why I’m posting it here on this day, exactly 68 years later. Blend together sugar, salt and spices. Add to pumpkin. Add beaten eggs. Stir in hot milk. Bake at 425° F until filling is set, 15 minutes. Bake 30 minutes longer.